So here’s the easiest Easter snack. Sweet and salty. Crunchy and creamy. A little something for everyone at your Easter gathering. Have a Hoppy (I mean Happy) Easter! If you’re reading this you may be considering or have chosen Nashville for this once-in-a-lifetime experience, and you won’t regret it. Nashville has become one of the hottest bachelorette party locations in the U.S. The city’s bursting with delicious food, amazing music 24/7/365, Southern charm, friendly people and laid-back, fun-loving atmosphere. Plus tons of Instagrammable locations to capture the weekend’s memories. The party doesn’t stop in Music City! As locals we took our tried-and-true activity, food & drink, and shopping recommendations and created this detailed guide to help you plan the perfect destination Nashville bachelorette party experience for your bride’s last bash in Nash! Boots optional. Luckily you’ve chosen to spend that last hurrah weekend in Nashville. The party doesn’t stop in Music City USA. With live music is rockin’ 24/7/365, the city’s foodie scene in full swing, Southern hospitality, and laid-back vibe—Nashville’s one of the nation’s hottest party destinations. Whether you’ve previously been to the city or not, we’ve pulled together 10 Nashville experiences that will help create an epic bachelor party for the groom! Locals and those just in Nashville for the weekend capture their experience with photos in front of one (if not several) of the city’s colorful walls and murals. They’re the perfect insta-opportunity! Instead of driving around hoping you’ll find what you’re looking for, I’ve rounded up some of our favorite Instagram-worthy walls throughout downtown Nashville and the surrounding neighborhoods. A long weekend is not near long enough to see all Nashville has to offer, but we're going help you make the most of your short visit to Music City USA with a 72-hour itinerary designed for first-timers! Enjoy delicious meals, learn about the music industry, and do some local shopping all while hitting the highlights with time for relaxing and enjoying live music! Nashville is bursting with Southern hospitality, delicious food, eclectic bars and vibrant nightlife, live music, interesting history, plenty of sights, and a relaxed fun-loving atmosphere! Of course if you’re already planning a trip there, you probably already know. What you may not know is the little nuances that help make Nashville…well Nashville. Before you go take a few minutes to learn a little about Tennessee’s capital and most populated city with a few tips that may or may not surprise you. However you decide to make this “potato-topped meat/“meat” pie” will make a hearty, filling and comforting meal! I’d love to see the Irish countryside and walk it’s storied city streets one day, but until then I’ll be listening to The Irish Rovers, dressing in Kelly Green, sipping some Irish whiskey and enjoying some Gluten-Free, Vegan Shepherd’s Pie! It’s 3/14 again which means Happy Pi Day to all! I love pies, I do. In honor of this most delicious day I’ve rounded up my favorite pie recipes up to studioist.co for your baking (and eating) pleasure. A typical household is riddled with plastic products—many of which are non-essential parts of our lives that cause so much damage to the environment. We’ve pulled together a list of 9 easy ways to reduce single-use plastic usage in your household with simple, eco-friendly alternatives and lifestyle adjustments. Therefore in honor of National Meatball Day, we decided it was the perfect opportunity to chow down on our oldie but a goodie sandwich style—the humble meatball sub with a gluten-free, vegan spin. And man oh man did it hit the spot!!! 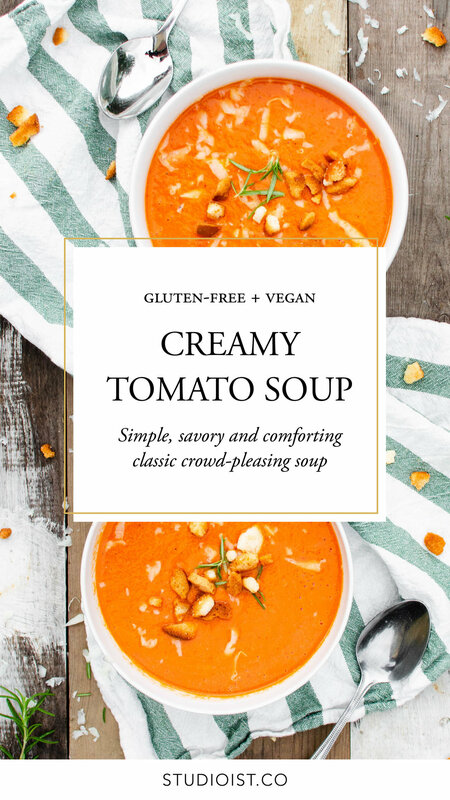 Tomato soup is one of those recipes only using a handful of ingredients and is naturally simple. Chop ingredients, toss in pot, and simmer. Each spoonful is savory, hearty and flavorfully fresh tomato-filed! Say that five times fast. :) However you serve it whether it be as an appetizer, entree or side dish, this soup is sure to be a crowd-pleasers. Take it even one step further with some optional but always recommended toppings like croutons, garlic toast, cheese, or crackers. The U Street corridor’s cultural history remains intact in this vibrant Northwest DC neighborhood and the perfect place to spent an day exploring. In this travel guide you’ll find some of the best places to eat, things to see, what to see and do while exploring DC’s U Street neighborhood. Adding a base and topping are a simply way to take simple, delicious brownies (whether they are boxed or not) and upgrading them to something unique and different. The bottom pretzel layer adds crunch to the moist brownies. Then topped with creamy chocolate frosting…YUM! I know Valentine’s Day was last week but you can never show and tell someone how much you love them too many times. And I LOVE my husband! Our August destination wedding day beautifully captured by Dallas Wilson Wedding Films in Kula on Maui, Hawaii. Treat yo self (+ yo ladies) to a Galentine’s Day sweet in the form of a Giant Vegan Cookies n’ Creme Rice Krispy Treat Kiss—combining the chocolate-y crunch of creme-filled sandwich cookies and the nostalgia of rice krispy treats, all with a vegan twist! Need a last-minute Galentine's Day or Valentine's Day treat? This simple 3-ingredient, no-bake upgrade takes a childhood favorite and elevates it to create a delicate and festive sweet treat. So what makes a Twix so tasty? The delicious shortbread-style cookie topped with caramel, then coated with chocolate. Anything with those words in it has got my attention! It would be impossible to experience all this country has to offer in a single trip. We lived in Australia for a year and still didn’t see everything. Australia will always have a place in our hearts and we can’t wait to make it back to some of our favorite places, but for now here’s a list of 10 of the coolest experiences to have while in Australia! Travel Itinerary | 3 Day Great Ocean Road(trip)! No two visits will be the same. Some days the ocean is turquoise and calm, other days massive swells white out the shore. Some days a light breeze, other days it feels like your car is going to blow away. Different seasons, different colors, changing landscapes, and changing experiences. Whatever your experience is, the Great Ocean Road is sure to be a highlight of your adventure down unda’! It certainly was for us. LeBraun still can’t stop talking about it. We’re sharing our experience and details for planning the perfect long weekend, 3 day Great Ocean Road (trip)! Creativity flows throughout Melbourne and its spirited street art scene is renowned worldwide. Walking down each laneway is like a free, ever-changing gallery. Around every corner, another mural. On the side of every building, a work of art. Look up, look down, look side to side. Here are some of the most popular places in Melbourne to find and photo new and exciting street art, and a small collection of some of my favorite works around the city - however finite their existance. Hi, I'm Shalan! Studioist.co is my journal devoted to adventures, creativity, recipes, and my husband LeBraun and I's semi-nomadic lifestyle. I spend most of my days wondering how to combine my two loves, traveling and illustrations. The rest of my time I spend trying to create awesome gluten-free, dairy-free recipes. I want this to be a place of inspiration and encouragement as well as a fun place to spend your time. And yes, sometimes it gets messy, but I wouldn't have it any other way. Spring Recipes + Good Vibes!